I have never kayaked before, will that be a problem? No experience necessary on any of our trips! Safety is our number one concern, which is why on every trip we provide stable double sea kayaks. Double kayaks are often much wider and more stable than single kayaks and are a great jumping off point for beginners or paddlers who enjoy the comfort and stability of double kayaks. Before every trip our guides will take you through a very thorough on land orientation where you will learn how to outfit yourself, your boat, as well as paddle, steering and safety techniques. Once we are on the water our guides are there to continue your ocean kayaking education and are happy to help give you pointers that will increase your paddling skills. Keep in mind that most of our half-day and full-day tours are close to shore, therefore are more protected. We tend to see a variety of wildlife closer to the coastline, allowing us to explore the wonders of nature from the comfort of our sea kayaks without straying too far from land. Welcome to the wonderful Pacific Northwest, where it often rains to keep our landscape beautifully green and lush! Paddling in rain can actually be quite amazing and allows for the opportunity to see lots of wildlife! Wearing good rain gear will help keep you comfortable and happy throughout the day. Keep in mind that we wear waterproof spray skirts, therefore a majority of the tour only your upper body will be exposed. Most people are surprised that rainy days on the water are their favorite! If the sunshine does decide to come out in the middle of the day, it will be even that more rewarding! Trips run rain or shine and will only cancel due to storms or unsafe sea conditions. For information on our cancellation policy click here. How Stable are the kayaks, will they tip over? Double sea kayaks are much wider and more stable than single kayaks and although a tip is very rare, it can happen. Paddles always seem like good “water-fighting” tools, but a water-fight is almost a sure bet for a flip. Getting in and out of your boat can also be a bit tricky, therefore avoid standing up in your kayak and you will be much more stable. Other than that, follow your guides lead as they will teach you tricks of the trade to help you learn how to keep your boat stable, upright and avoid that “out of boat” experience, while helping you navigate tricky paddling situations, to keep you safe and having fun. Still worried, give us a call and we’d be happy to talk you through our safety protocol and walk through anything that may worry you. What should I wear on a half-day or full-day tour? We suggest you wear non-cotton clothing such as merino wool, polypropylene or other synthetic layers. Light layers are best so you can peel them on or off as the temperatures change. Refer to our half-day and full-day gear list here. Your feet will get wet so please be prepared with shoes that have backs so you don’t loose them in the water. Teva’s, Chacos, Keens, Vibrams, neoprene booties, old tennis shoes all work great, avoid flip-flops if possible. Wear pants that can either roll up to your knee or shorts so you don’t get clothing wet as you get in and out of your kayak. We generally do not kayaks due to availability. If you would like to send us a request form with dates that you would like to rent we would be happy to see if we could accommodate. We do offer guided tours (which include tandem sea kayaks, and all related kayaking gear) that are quite comparable to kayak rental prices and you even get a knowledgeable, friendly guide to show you the way and help improve your skills. If you are looking to rent kayaks in the Bellingham area check out the Community Boating Center located in Fairhaven or Yeagars Sporting Goods in Bellingham. Keep in mind you will need wet-exit and rescue skills to rent any of the CBC sea kayaks. Starting June 2019 we will be offering sit-on-top kayak and S.U.P rentals at the Wildcat Cove boat launch. More info on website coming May 2019. Do you offer trips on Lummi Island? We do! We paddle the west side of Lummi Island, departing from Legoe Bay. 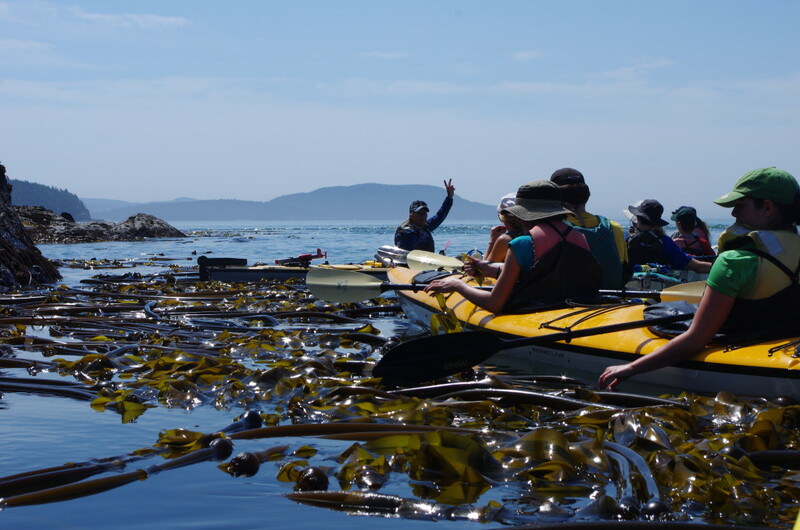 All Lummi Island trips (Wild Foraging and Full-Day Kayaking) are $130.00 per person and generally run from 10:30am-3:00pm, a full-day of adventure! We can pick you up at the ferry terminal or the Willow’s Inn. Select your pick-up location upon booking. Book your trip now! We also offer 2 Day overnight trips to Lummi for a quick, fun overnight experience or departing Lummi to Clark Island. Yes, we love family fun adventures! However, not every tour is the best for your child. For most of our day and half-day trips we generally suggest 8 years and older. Every child has different ability levels so let’s discuss a trip that would fit for you and your child’s needs! We are a family friendly kayaking operation and love getting young ones out in a supportive environment. We have taken as young as 6 and have the option to put youngsters in a triple kayak, with two stronger paddlers in the front and rear cockpits. Water in the Salish Sea can be extremely cold, and although kids usually fare better than adults in these waters, we like to make sure they are extra safe. We are happy to organize a private tour for you and your family, which would allow us to paddle in a much more protected area and familiarize your child with the wonders of sea kayaking. Half-day trips make for great family fun for a wide variety of ages and abilities! Send us a reservation request or Contact us at (360) 738-7664 to organize a trip for you and your young family. You can redeem your gift certificate easily online. Choose the trip you gift certificate is for, select your date and time. Once you have chosen your date, select number of people. Under your information it will ask you to “add promo or discount code” – click on that link and enter your generated gift certificate code. From there you will see the price drop to zero or adjust depending on if you upgraded your trip or not. If you have trouble or do not see the date that you are looking for please give us a call or shoot us an email and we will see if we can accommodate you on another day. **Please Note: All reservations are subject to available space so have the holder of your gift certificate call or enter their promo code in our online reservation early to reserve space. Our gift certificates can be transferred to another person if written consent has been sent by the original gift certificate owner. Gift Certificates are transferable and can be used on any tour of equal value or can be upgraded to other trips at the time of booking. Donated gift certificates expire upon the marked date and are non-refundable and are not for re-sale. Please ask if you have any questions regarding our Gift Certificate Policies.